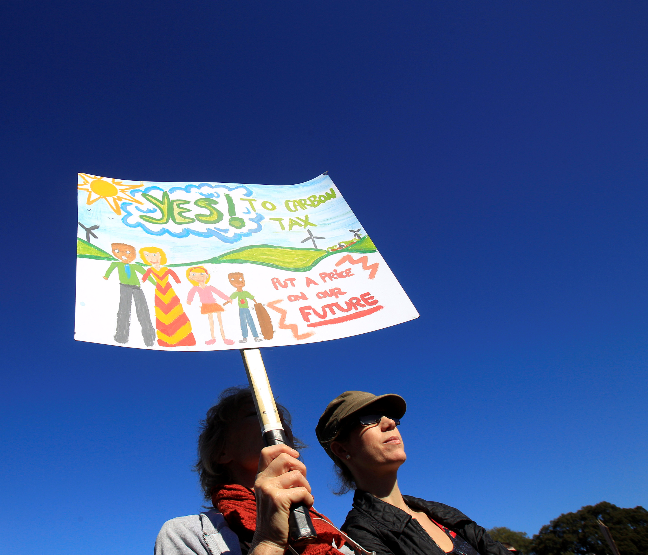 Is A Carbon Tax Practical? The evidence for global warming is overwhelming and largely beyond dispute. On the other hand, our industrialized world is highly dependent on the fossil fuels which produce it. This is what makes global warming such a hot political potato. It was introduced in 2008 by the Liberal Party which is actually quite conservative. It survived a challenge by the left-leaning New Democratic Party in 2009. The economy in British Columbia grew faster than its neighbors even as its greenhouse gas emissions declined. Despite the price increases, voters warmed to the tax. In 2015 only 32% of British Columbians opposed it, down from 47% in 2009. Every single carbon tax dollar is returned to families and businesses through a variety of tax breaks. British Columbia’s experience shows that a carbon tax can work in practice. Here are a couple of reasons why such a tax should appeal to a broad political cross spectrum in the U.S.
A properly calibrated carbon price in the United States could effectively replace all the climate-related regulations businesses hate so much, including renewable fuel mandates and President Obama’s Clean Power Plan. A carbon tax could become part of a broad fiscal overhaul, using the revenue, for example, to offset cuts in payroll taxes. Conclusion. The rapidly changing climate and weather patterns caused by global warming are a threat to human civilization. 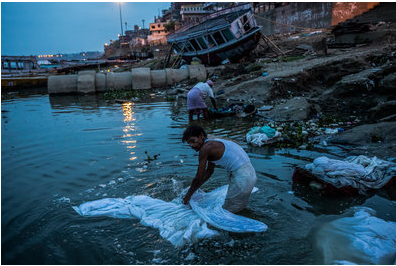 Reasonable measures can be taken to mitigate the effects with minimal economic disruption. As the world’s strongest economy and leading superpower, the U.S. should be providing more leadership towards addressing this very serious problem. Wind and solar together provide less than 2% of the world’s energy and they aren’t growing anywhere near fast enough to replace fossil fuels. 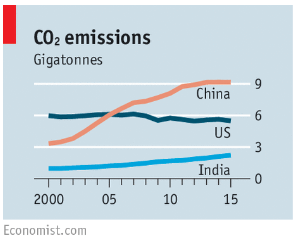 China’s coal consumption is growing at 2.6% per year and India’s at 5%. In India there are 300 million people without access to electricity. The Paris plan wants India to be satisfied with a .6 metric ton of oil equivalent per person, when a minimum of at least four tons per person is needed for the development of an advanced nation. Safety fears about nuclear power are overblown. The 1979 accident at Three Mile Island caused no significant amount of radiation to be released. The 1986 Chernobyl disaster was caused by a faulty design and operator incompetence. 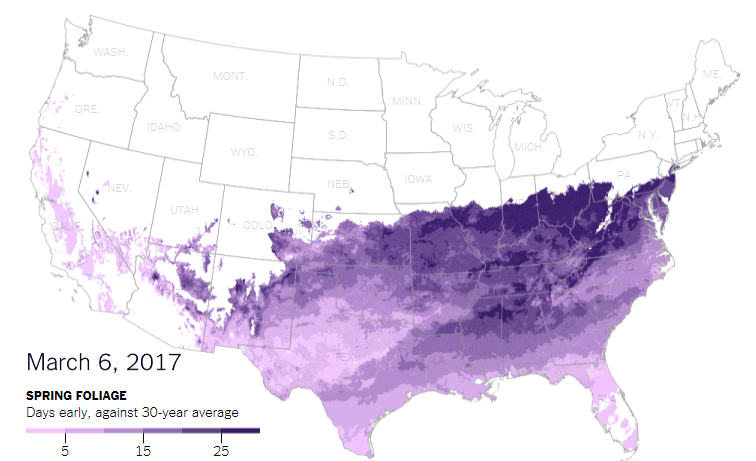 Fewer than 50 people were killed by released radiation compared with 13,000 killed every year by smoke from coal-fired power plants. The 2011 Fukushima disaster resulted in no deaths from radiation. A new generation of American nuclear scientists has produced designs for better reactors which have the potential to overcome the biggest obstacle to the success of nuclear power: high cost. I hear many people say that the U.S. needs to provide leadership in getting the world to stop using fossil fuels. A carbon tax would provide an economic incentive to either move away from fossil fuels or clean them up. But even a revenue neutral carbon tax would face strong political resistance. Climate change activists should consider supporting nuclear energy development as perhaps the most viable alternative to fossil fuels. 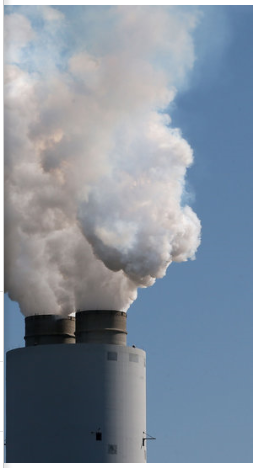 My last post, “Why We Badly Need a Revenue Neutral Carbon Tax” makes the case for combatting global warming with a sensible free market mechanism such as a carbon tax rather than a hodge-podge of arbitrary national and state regulatory actions. Since many of the Facebook responders to this post deny the reality of global warming in the first place, I have decided to present the overwhelming evidence for its existence. The Global Surface Temperature is Rising. 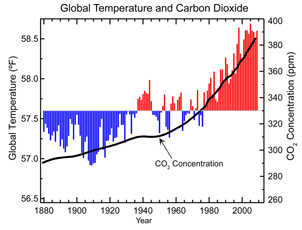 Global average temperature has risen 1.4 F since the early 20th century as shown in the chart just below which also shows the close correlation with carbon-dioxide concentration. The Sea Level is Rising. It has risen at an average rate of 1.7 mm/year over the last 100 years and at the rate of 3.5 mm/year since 1993 which is equivalent to one inch every seven years. Global Upper Ocean Heat Content is Rising. The top 700 meters have warmed by .3F since 1969. Thermal expansion of the ocean water as it warms contributes to the sea level rise. Glacier Volume is Shrinking Worldwide. Just Greenland and Antartica alone have lost at 150 cubic kilometers of ice annually in recent years. 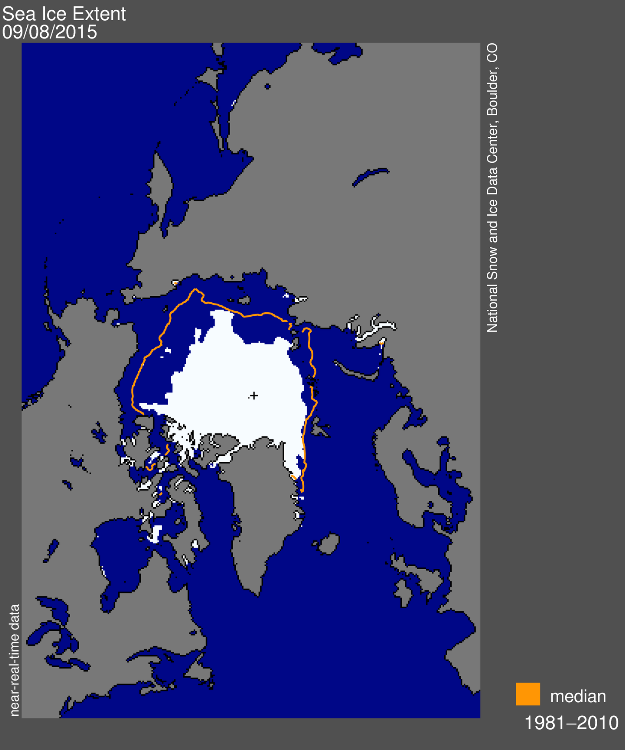 Declining Artic Sea Ice. Both the extent and thickness of artic sea ice has declined rapidly over the last several decades (see chart below). I accept the reality of the scientific evidence for global warming but I am certainly no “alarmist” in terms of what our response should be towards addressing it. It will be many, many years before renewable energy sources like wind and solar are able to make a substantial dent in worldwide energy needs. The best thing to do in the meantime is to attempt to decrease carbon dioxide emissions from fossil fuels through carbon capture and storage. A carbon tax would create a huge economic incentive for the coal and oil industry to solve this problem. If and when they figure it out, it is likely that the technology involved would rapidly spread around the world. This would represent a real solution to a very serious problem.